YarnWhore has caught knitty fever. 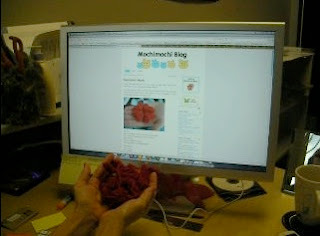 That's a big bundle of little MochiMochi hearts in her hand. And here's the earflap of a hat being knitted up for Soon-to-be-Mr-YarnWhore. 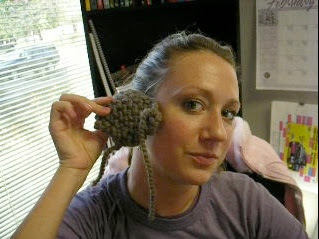 And of course, YarnWhore's obligatory jackalope. We are planning to knit him a new nose. Something to match his antler accessories. Please note: No jacklopes were injured in the posting of this blog. This particular jackalope followed YarnWhore home from a garage sale. She fed him and, well, next thing you know, he won't go away. He made himself comfortable on her wall and once the cross-dressing started she couldn't just turn him out onto the streets. We're not monsters, you know. 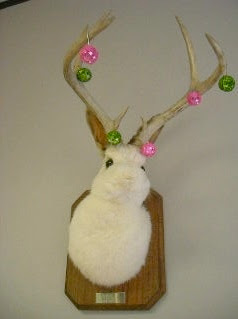 Sassy Mr. Jackalope feels so pretty with his glittery antler dangles. He told me how happy he is to finally have a pic on the blog. He's so fancy.